You can take shopping trips, enjoy days out, or travel the world independently. or, give you the confidence that you will be able to keep up with friends and family. But don't just take it from us; read what luggie riders have to say on our customer review page! With headlines like these they definitely found new freedom with a Luggie travel Mobility scooter. 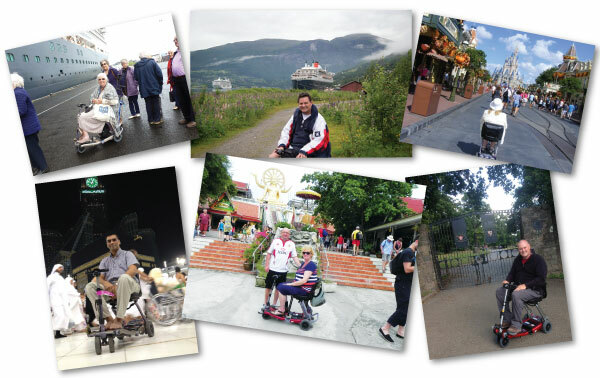 "To those who were like me undecided & nervous - I say go ahead you will never regret it"
"I love the freedom my Luggie has given me"
So if your inspired to try, why no book a FREE, no obligation HOME DEMONSTRATION of our travel mobility scooters. You can trial all 5 model in your home, anywhere in the UK. Our demonstrators will help match the right Luggie based on your individual needs. Luggie Standard Lightest model in the range, Airline approved lithium ion battery, Folds compact in under 20 seconds. Luggie Elite Unrivalled Folding Mobility Scooter, LED battery display, Carries up to 21 stone, Travels up to 13 miles. Luggie Super Heavy Duty Travel Mobility Scooter, Carries up to 25.7 stone, More leg room & wider seat, Larger motor. Mobility Scooter Finance Available You’ll be riding on our 100% quality customer service as always...but now with an unrivalled 5 Year Warranty on the complete folding Luggie range! 5 year warranty on all our Luggies First Class Customer service 100% of the time FREE expert advice & no pressure demonstration Unrivalled aftersales service To provide the right product or service tailored especially to you. For further information on any of our travel mobility scooters, or a convenient no-obligation Home Demonstration call us today on 0800 012 4258.